Stanton, part of the Gibson Pro Audio division, has announced Version 4.0 of the SC-IX operating system for its SCS.4DJ Complete Digital DJ System. Stanton released the SCS.4DJ in 2011, a fully integrated solution that is capable of providing the functionality and performance demanded by today’s DJs and performers. 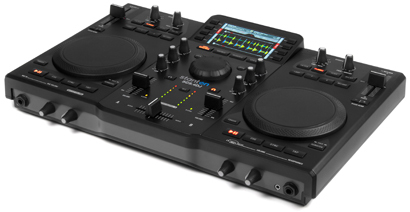 The SCS.4DJ’s state-of-the-art processors remove the need for an external computer when performing, making it a complete digital DJ system. This fresh approach means a DJ can simply plug in a storage device and start mixing using the built-in decks, mixer and high-resolution colour display. Song Preview Path – The update has added the ability to preview a song directly from the song browser. Gain Functionality for Each Deck – This allows for user-adjustable gain control, which is stored with each track. VU Meter Source – This gives users a visual representation of Master Output or Decks A & B. Artist Column Added – Now artists are included in playlist information. Resort Active Playlist Capability – Now the active playlist can be sorted by artist, BPM and time. Increased Pitch Range Options – Adds +/- 8% and +/- 15% to existing options. BeatGrid Editing – Users have the ability to edit a track’s beatgrid in realtime, with both "Tap Tempo" and "Dial-In-BPM" functionality, for increased Sync and Loop accuracy and stability. The new SC-IX Version 4.0 release and both Mac and PC versions of the QuickGrid high-speed analyzer are now available for download from the Stanton website.